This Navy Short Dress with Embroidered Mesh Back Detail is so pretty! This perfect cocktail dress features an embroidered top and mesh back. It is simply stunning! Approx. 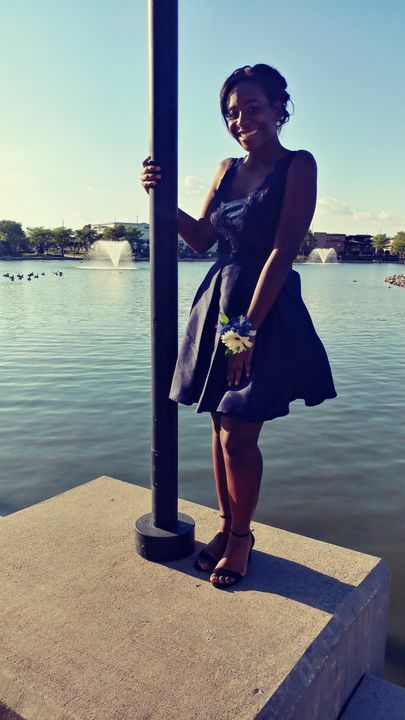 Length (shoulder to bottom hem): -Small: 34" -Medium: 34.5" -Large: 35"
My daughter wore this dress for Homecoming this year. The dress was quality, true to size and arrived timely. We did have to have it pressed due to wrinkles from travel and packaging but we expected that. We also did end up having a little tulling sewn in by the cleavage as it was really low cut (which I also was expecting) for a young woman but it turned out great! She loved it and she got tons of compliments!!!! Received my order super fast and it is beautiful! Fits like a glove, can’t wait to wear it to a wedding in May! Fits perfectly as described!! Love this dress!